I built this years ago but I thought I would share my glue up box with you. I was just learning how to use the Incra Fence system and these were some of my first half blind dove tails. Not sure who else even still uses these things. Made from some scrap 3/4” poplar that was glued up for the center board handle. No nails or screws were used in its construction. Finished with a light stain and a couple coats of poly. I find it handy to hold my glue up accessories, biscuits, and my wet brushes all in one place. I recommend this kind of project for anyone who need to practice a technique or finish. I have one of these, but mine is made out of a six pack beer bottle container. I bet, like me, you have found this glue box to be nowhere big enough?? I have to share my space with a car so there is never enough storage space. So, I try to maximize the space I do have and stay organized. I used to have bottles fall over, get all full of sawdust, wet acid brushes with no place to put them, etc. I have learned to keep everything together and in one place. I love pictures and those who are far more creative than me. Brad, nice work and a nice finish on the box. You are right, if you are going to be productive in the shop, you must be organized. 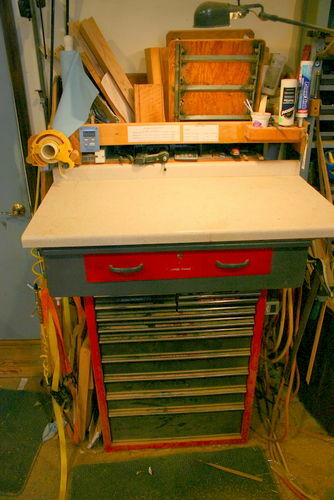 Time spend looking around the shop for tools is a complete waste of your most precious commodity…time. One of the best things we can do with boxes is use them to organize our stuff. Having the luxury of more space, I made a table to fit on top of my tool chest. It has everything I need to glue up boxes. I can scrape the top clean with a putty knife, and I keep my acid brushes in water and can re-use them for months. For more complete explanation, click here.